I'm making Steve's Hungarian goulash Soup tonight. We'll have it with baguette and butter. Mmm... that sounds good. I haven't had it myself for a while, but we're starting to get into spring now, so I'd better make a batch soon. 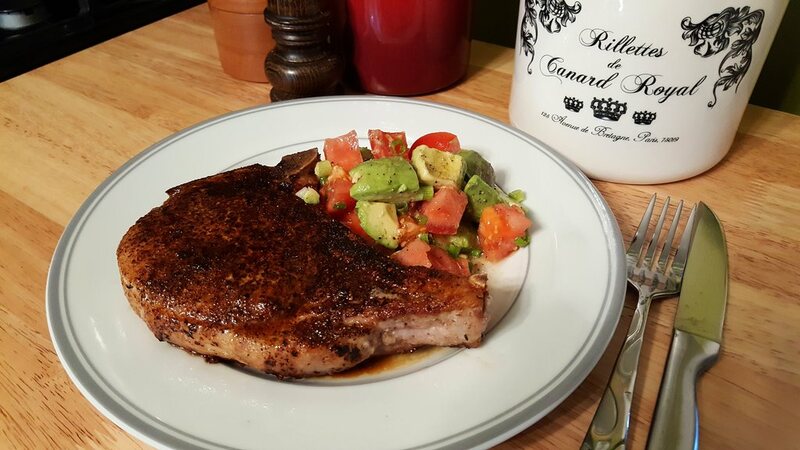 I had a pan-seared pork chop, and avocado tomato salad. I should, probably, feel a bit of guilt..but.. I don't.. In Hawaii we simply call it Portuguese Sausage, MY FAV!!! Vas es los, linguisa? Lingua is tongue, I think. Tongue sausage? ... but here's a good blog post about Hawaiian Style Portuguese Sausage. Thanks, K-girl! This interests me. Great comparisons. CWS....give me a hint on the apricot chicken. I made some chicken today and DH is a huge fan of apricots. He'd love that. Today, chicken and mac n cheese, brussel sprouts later. baked sweet potatoes to round it out. like that meat in a can. and that's what I had for dinner tonight. I really don't have a recipe. I do this in the pressure cooker. First, I take about 1 cup of dried apricots, chop them, and then soak them in apricot nectar (about 1 cup) and 1 cup of hot water. Meanwhile, I mix some soy sauce, Chinese 5-spice, ginger, garlic, apricot preserves, wee bit of brown sugar, adjust by taste. I brown the chicken breasts in the pressure cooker with about 2 T oil or coconut oil, drain the "juice" from apricots, add that to the pressure cooker, put the lid on and make sure there is at least 1-1/2 c juice--that cooks for 12 minutes at 15 psi. I cool it using the quick-cool method. I remove the chicken from the pot, add the plumped apricots and some corn starch to thicken the stock. I then tumble everything over either rice or udon noodles. Not too complicated, I just throw it all together in the pressure cooker and it works. When I don't have apricot nectar, I use orange juice. Today I added mushrooms, onion, and green peppers after I browned the chicken and before I added the liquid. If it weren't for my Dad, I would add some fresh cilantro (chopped) on top as a garnish or some chopped green onions.